Here at SKB Sails we offer a complete repair service and will do everything we can to help you keep your sails and covers going as long as you require. It is very rare that we tell our customers we cannot repair things, though we will advise if we feel it is not economically viable. 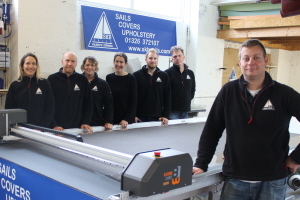 We also offer a professional laundry and cleaning service for sail, covers and upholstery with mildew treatment and re-proofing offered as extras. This service has a two week turn around in the winter (though repair will take longer) or an on demand courier service through the summer. Along with our winter valeting service we also offer storage on purpose built shelving at our loft which is clean, dry, heated and ventilated so we can be sure that the risk of mildew is minimal. If you are not having your sails and covers washed by us we advise that items are brought to us dry. However, we understand that the Cornish weather does not always allow this so if your covers or sails are brought in wet we will do our best to hang dry them out before correctly folding and storing.